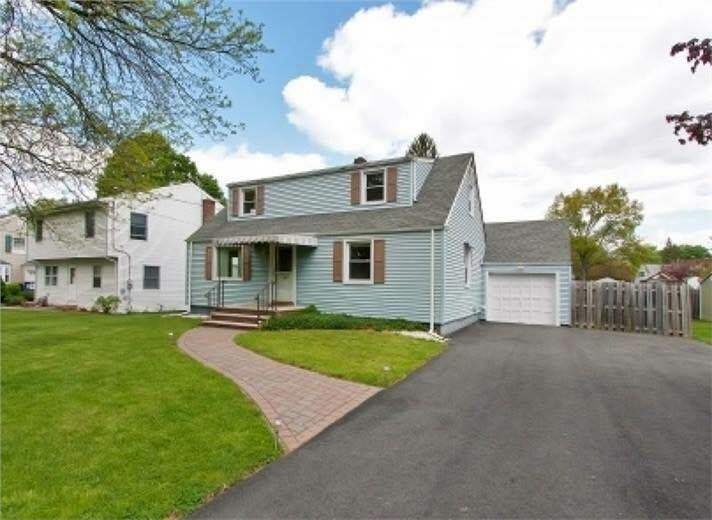 As I mentioned in my inaugural post, we had a particularly hellish house hunt (think 9 months, 5 offers, and nothing but bidding wars…). We ended up with our cute little house in a great neighborhood and an AWESOME yard, and while it was definitely “move-in-ready” it also provided us PLENTY of opportunities to freshen things up a bit. Most notably, it was severely lacking in curb appeal. 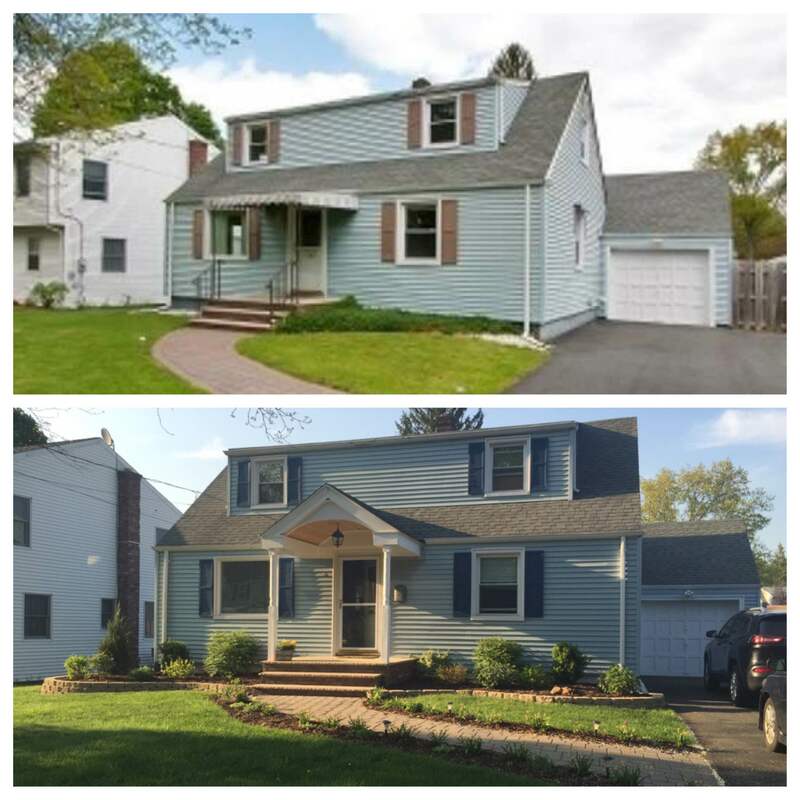 The shanty awning, the lack of landscaping, the powder blue siding and poop-brown shutter combination- it certainly seems like years of poor decision making and lack of effort really took its toll on our poor little house. We didn’t have delusions of grandeur- recovering financially from buying the house and all of the wedding and honeymoon expenses was not going to allow us to jump headfirst into any major projects. The first thing we did was paint the shutters. We admittedly did not end up with as dark of a blue as we had hoped, but after some close calls on the ladder due to a standoff with the wasps that had taken up residence behind them, Mike was not exactly volunteering to hop up there and redo it (and it still looked better than it did before). The next thing we thought we were ready to tackle was adding some curb appeal with landscape improvements. We are very fortunate to have many multi-talented people within our network of family and friends, and our awesome friend Dave spent several years running a landscaping business and he kindly lent us his ideas, time, pick-up truck and elbow grease to get us started. The first thing that they did was prepare landscape beds and build a small stone wall to give the space a little bit more “oomph”. Once the area was prepared for planting, it was time to get to our local garden supply to pick out our greenery. I am warning you right now, if you are taking on a ground-up DIY landscaping project- DO YOUR HOMEWORK. Mike and I have proven to be less than stellar at plant planning and selection. There are so many plant choices and sizes, and it’s worth the extra time up front to get a real strategy on what exactly you are going for. Front garden beds & our first shrubs! To circle back to my point about planning ahead and doing your homework… seriously, do it. Also, don’t be afraid to ask questions. We still haven’t fully learned our lesson, and on our last trip for a tree and a few filler shrubs we found ourselves in our familiar nightmarish situation, frantically looking at tags for how large things grow, googling whether they were deer resistant, arguing the merits of Autumn Brilliance or a Juniper tree. Every trip inevitably ends in me saying, “I’m (hungry/tired/hot/bored) and I want to go home,” (which I may have picked up from my three-year-old niece), a hasty purchase of whatever random conglomeration of plants has wound up in our wagon, and a silent ride home. Consider this a Public Service Announcement- don’t do the farm and garden store like we do. All you’ll end up with is shame, and a front landscape that you refer to as “the jungle”. Despite our trial-and-error approach last year, now that Spring has sprung and everything has started to bud and bloom I have to say overall I think the result is simply beautiful. It’s certainly an improvement from the baseline! It is definitely a work-in-progress and will evolve over time but I’ve come to love our little mismatched jungle. Doing the work ourselves and trying to choose shrubs that would be aesthetically pleasing as well as cost-effective, it was a relatively small investment for a large impact (I would estimate we spent somewhere between 1500 bucks but Mike would probably have a more accurate number). Before and after picture below shows the original picture juxtaposed to what the house looks like as of a week ago, after adding a Juniper tree on the left and white hydrangea on each end (which I am hoping will bloom for us this year, but may not because they were just planted). Obviously there is another big change between the before and after- we ripped the shanty awning down one Friday night in August on a whim, and we designed & Mike built a portico in its place. I will write about that in a future post: Operation Curb Appeal Part 2- So Long Shanty Awning!